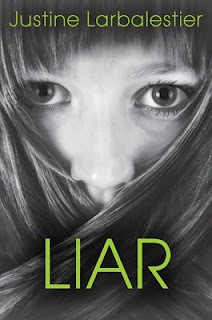 Liar by Justine Larbalestier. Bloomsbury USA. October 2009. Reviewed from ARC. Copy from publisher. The Plot: Micah is a senior in high school. She lies. She knows she has to stop; and on page one of Liar, she promises to tell you her whole story with no lies. Micah tells you about herself, her school, Zach (the senior who just went missing), her family. And she tells you the truth. Except when she is lying. She cannot help herself; it's not just a bad habit, it's something she inherited. Her father, she tells us, is also a liar. And with the family illness that got passed down to her, she is almost forced to lie. But reader... she'll tell you the truth. Or, at least, admit when she's lied. Or when she lies about the lie. What is true? When can you believe a liar? And what happened to Zach? Larbalestier creates such a sense of foreboding -- of impending doom -- that the reader can almost taste it. Something bad has happened. Something bad will happen. What is it? What secrets have turned Micah into such a liar? As Micah says, "Weaving lies is one thing; having them weave you is another." Then, suddenly, half way through the book, Micah shares it. Her secret. The reason she lies. Suddenly, it makes sense. All the clues are there for the reader to figure it out. Finally, the reader can breathe easier. Now we know. We know and we can trust again. And the book shifts to mystery, a different type of suspense, the tone changing dramatically, as Micah tries to figure out what happened to Zach, and, now that she's being honest with us, her role in it. Except.... is she telling the truth? First person narrators aren't always unreliable. Sometimes, they are used to make something more immediate, to create a stronger connection between reader and story. At other times, such a narrator may not know the whole story, and the reader, wiser, more removed, is supposed to know more, see more, and to figure things out before the narrator. And sometimes...they play with us. They know the story. They decide what parts to tell us. Or not tell us. Micah lets us know, up front: Lies. Liar. And at the end of the book, the question for the reader becomes -- when do you believe Micah? When do you not? And what does that say about you? Larbalestier's writing is brilliant; Micah's voice seduces us, tricks us, makes us want to believe in her, yet we are also afraid, unsure, uncertain. We know her; her school; her family. Or do we? Just how good a job does Larbalestier do? While I know Micah is manipulating me, the reader -- I never feel like Larbalestier, the author, is. The wonder of this book, the beauty with how it is crafted, demands that you, as the reader, do not say "Rosebud was a sled" to people who haven't read this book. Wait until they are done; find a secure, sound proof room; and then talk away, about Liar and Micah and Zach. My post, Don't Judge a Book By It's Cover, pretty much sums up my opinion of the controversy. As a quick recap, the image to the left of a white teen was originally planned for the US cover. This created a lot of controversy (see my link above), and ended up being resolved by the publisher creating a new cover, the one you see at the top of this post. I'll add this: I still believe there is a larger issue here. If publishers and bookstores truly believe that books with people of color on the cover (or books about people of color) don't sell, the easy way to counter that opinion is to buy, read, review, display, and book talk all books. It's a business; and if the sales and money show the publishers and bookstores a different reality, they'll believe it. Hrms. Is it possible that they didn't put a "person of color" on the cover because they were afraid of the outcry putting the title "Liar" over a person of color's face would cause? whereas it is okay to put it over a white girl's face? that's what I thought the controversy was about in the first place. You are one of our Color Me Brown winners. Come by and select your book prize from our Prize Bucket. Send me your snail address and title. I love it when you finish the book thinking about how perfectly done it was. Thanks for the review. I used to wonder whether the controversy over the cover was just a marketing ploy, any press is good press kind of thing. I'm glad to hear that it is actually a good book. Congrats on winning the Color Me Brown Challenge! This review was awesome, this book is at the top of my wishlist (once I edit it that is!). I think this book could have easily sidestepped the question of who is on the cover by not putting a person on the cover. 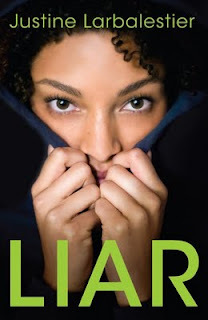 So if someone said "oh no, we cannot have a black teen with LIAR" over her face, the option is to do a cover like the Australian edition with no person. Color Online, ACK! Yay! I never win, seriously. Must go see what YA book is in the list that my library doesn't own. Miss A, thanks so much! Allison, I don't think this was deliberate controversy; and it is an excellent book. Whee! I can't wait to read this one. Thanks for the great review and for your watchdogging on the cover issue. Great review, this book sounds amazing!